Actually, that 1991 date is misleading. 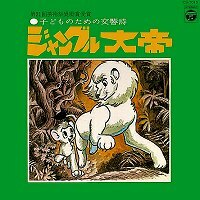 In 1967, Isao Tomita, the composer responsible for all the beautiful music heard in the original Kimba The White Lion, reworked his music into a 50-minute "symphonic poem". The term "symphonic poem" originated with composers of the Romantic era; basically it's a long-form work which is supposed to tell a story on its own. So, music that was written originally to enhance visual story-telling then became the story teller. Tomita's symphonic poem was recorded and issued on LP in Japan. More than once, in fact. 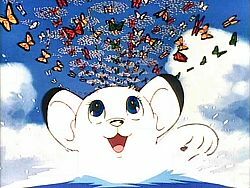 It has also been on CD more than once, and is always sought-after by Kimba/Jungle Emperor fans. 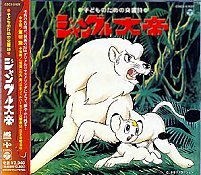 In 1991, the Tezuka studios created all-new animation to illustrate the music. There is a brief introduction in Japanese where each character's personal theme is played, but the main program is wordless, and so it can be enjoyed by anyone. Basically, it's the story of the first Kimba episode, all in music. We see the peaceful animal kingdom under Panja, the coming of the hunters, Eliza's capture and Panja's death. Kimba (Leo) is born and escapes back to Africa. All this told without a single word spoken. The style of the Symphonic Poem's animation is unique. It draws heavily on the style of the 1989 TV series, but Kimba (Leo) looks different from the way he looked in any other production. It's kinda cool--I always liked Tomita's music--but it definitely moves slower than any other animated work I can think of, because the pacing is determined by the music. Tomita's music was always a wonderful and important part of every episode of the original 1966 version of Kimba), but this is not like listening to a soundtrack collection. It is a full-fledged symphonic work based on themes written for the TV show. When available, you can find links to buy the film here.